All odds for Sets and items can be found on this webpage. Read on for a firsthand, transparent explanation of how odds work on Quidd! First, let’s define some terms. Set odds are the chances that the bundle you open will have one of the Cards, Stickers or Figures from the Set you are shopping from. Item odds are the chance that the Bundle you open will have that specific Card, Sticker or Figure. Another way to look at this is by thinking of the odds of getting something as being “1 in ___.” So if the odds for a Card in the Bundle are 5%, it’s like saying “1 in 20 Bundles” will contain the Card. This does not mean that if you open 20 Bundles you will get this Card guaranteed though. Odds only work with large numbers, so all we can really say is that if 20,000 Bundles are sold, approximately 1,000 of that Card will be pulled overall. Even so, since there is randomness, it’s possible that 1,200 are pulled. It’s just like this: Imagine you have a huge jar with 1,000 pieces of candy in it and 50 of them are Skittles. That’s a 5% or a 1 in 20 chance of pulling out Skittles. It doesn’t mean that if you pull out 20 pieces of candy, 1 of them will always be Skittles. Why don’t the percentages always add up to 100%? Let’s start outside of Quidd with a coin flip example. With one flip, the odds of getting heads are 50% and the odds of getting tails are 50%. The odds of getting one or the other add up to 100%. The chance of getting at least one tails is also 75%. The odds add up to 150%. Think of the possible outcomes from two coin flips. You could get both heads, both tails, first heads then tails, or first tails then heads. Those are the only four possible outcomes. Notice that 50% of the outcomes have one of each. These outcomes overlap, which causes the percent chance of getting one of each to be counted twice in the odds. Three of those four outcomes contain at least one heads and three contain at least one tails. That’s 3/4, or 75% of each. How does this translate to Bundle odds? When a Bundle has 5 Cards in it, we say that has “5 draws.” Each draw is like a flip. So as long as there is more than one draw in a Bundle, the odds will not add up to 100%, just like the odds of getting heads plus the odds of getting tails in two flips don’t add up to 100%. “The odds say 10% but I bought 10 Bundles and didn’t get one.” So how many Bundles would you have to open to get a Card that has 10% odds? Well, it’s a bit of a trick question. With odds, there are no guarantees, only probabilities. All we can say is that opening a certain number of Bundles gives you a certain percentage chance to get the Card. 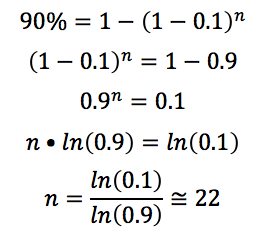 Here is the universal formula that applies to odds. You can use this to figure out your chances of getting the card you want! So what if the Bundle says 10% odds for the Card? If you open 10 Bundles, how likely are you to get the card? That’s right. If you open 10 Bundles at 10% odds, you have about a 65% chance of getting the Card. 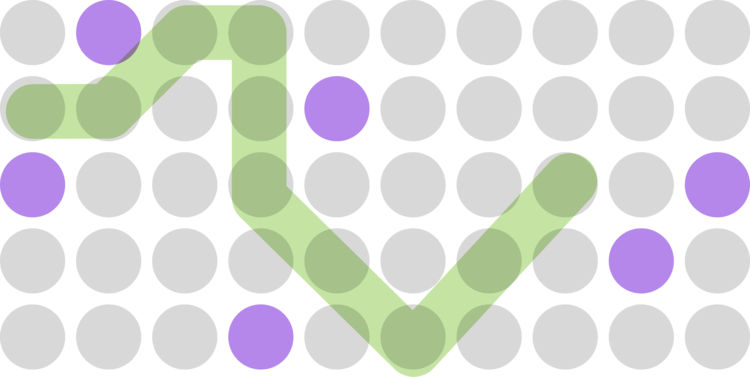 This diagram shows 60 circles, where 10% of them are purple. You can pull 10 circles and not necessarily get one that’s purple. So, how many Bundles would you have to open for a 90% chance at getting a Card with 10% odds? How do we get that? 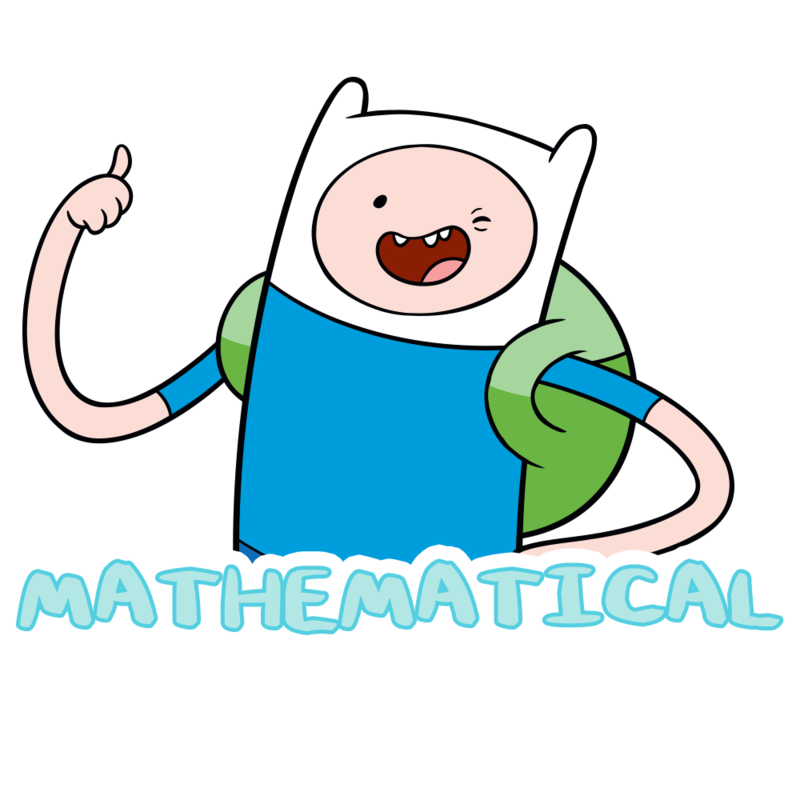 Solve for n.
So, this means you would need to open about 22 Bundles for a 90% chance at getting a Card with 10% odds. 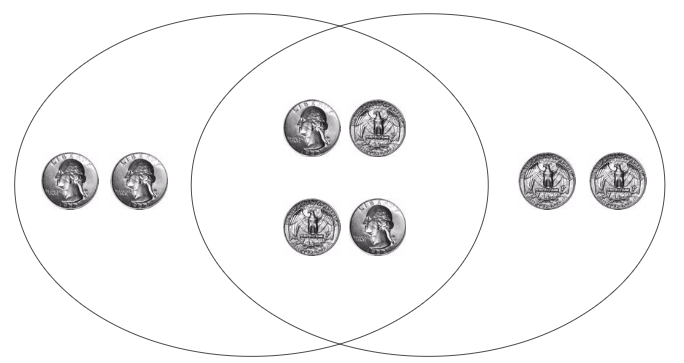 Hopefully this helps explain how odds work. Have fun collecting and check out the odds as you open new packs. If you have any questions about odds, please contact us at support@myquidd.com.